More from Nick's excellent guide - this time giving details of the fixtures and fittings of the church. Again please respect Nick's authorship and contact him via the Parish Office or this site. The font is the oldest object in the building, being 13th century, and thus a direct link back to the church of that date. It is made of Purbeck marble. The cover is seventeenth-century, and forms a group with those at St Michael-at-Plea and St Andrew, and also Horsham St Faith (which is coloured). Notable baptisms include Robert Greene, the playwright (1558), and John Crome, the artist (1768). The banners on the pillars were made around 1960, by Doris Hall, and the paintings on them were made by her husband, the Rev'd George Hall, Vicar of St George's 1941-72. They are copied from an East Anglian rood screen (which one is unidentified), and each shows one of the Apostles with his emblem. Each Apostle also has a 'label' or scroll (the medií¦val equivalent of a speech bubble) with one phrase from the Apostles' Creed, in Latin; it was believed that each Apostle contributed one phrase to this Creed (hence its name). Each phrase is given here in Latin, with its translation. The banners are described in Creed order, not the order in which they are hung. St Peter, with his keys. Credo in unum Deum, Patrem omnipotentem, Factorem cí¦li et terrí¦. St Andrew, with his saltire (X-cross). Et in Jesum Christum, Filium ejus unicum, Dominum nostrum. St Matthias (? ), with his spear. Descendit ad inferos; tetrtia die resurrexit a mortuis. St James the Less, with his fuller's club. St Thomas, with his set-square. And in the holy catholic church. The bread-table is the stone-topped table by the font. From it, bread was distributed to the poor  as late as 1890. Above it is the oldest surviving (but incomplete) monument - to John and Olive Symonds, 1609. The nave roof is a nineteenth-century replacement of the sixteenth-century original, although the wall-plates (cornices) are original, with acanthus-leaf carving. If the light is right, you can also see the arms of St George painted in the spandrels. The pulpit is an excellent specimen. It is currently thought to be French, and seventeenth century. Made of oak, there is ivory inlay in the front panel, and the wreath around it is of exquisite quality. It formed part of the three-decker pulpit, and was lowered in 1886. On the opposite pillar is a small statue of St George. This is a copy of the one by Donatello (1386-1466). The eagle lectern was presented to the church in 1910. The Rood (hanging crucifix) is a memorial to the Rev'd Walter Crewe, who died in 1920. The reredos is early eighteenth century, and, together with the panelling, is of oak. On the two central panels, behind the brocade, the Ten Commandments are painted in gold letters on blue. The two side panels have the Creed and Our Father: these are varnished over, but you can still make out the lettering. The altar table consists of the Stuart table, but made longer, higher and narrower (in line with nineteenth-century ideals). It also contains a medií¦val mensa, or stone altar slab. The gradines (shelves) and tabernacle date from about 1899. This, the original Lady Chapel, is now occupied by the organ. It was given to the church in 1888 by Philip Back, in exchange for the earlier instrument, which had stood first in the west gallery and then in this position. Although it bears the plate of A & S J Godball of Ipswich, they merely supplied it. Two stops (the Swell Stopped Diapason and Piccolo) are of eighteenth century manufacture. The mixture stops were removed in 1926. On the east wall beside it, is the Anguish monument. Thomas Anguish was Mayor in 1611, and founded the Blue Coat Boys' and Girls' Hospital (formerly in Fishergate). The monument is the work of Nicholas Stone (1586-1647), master mason to James I and Charles I. This contains the Lady Chapel. 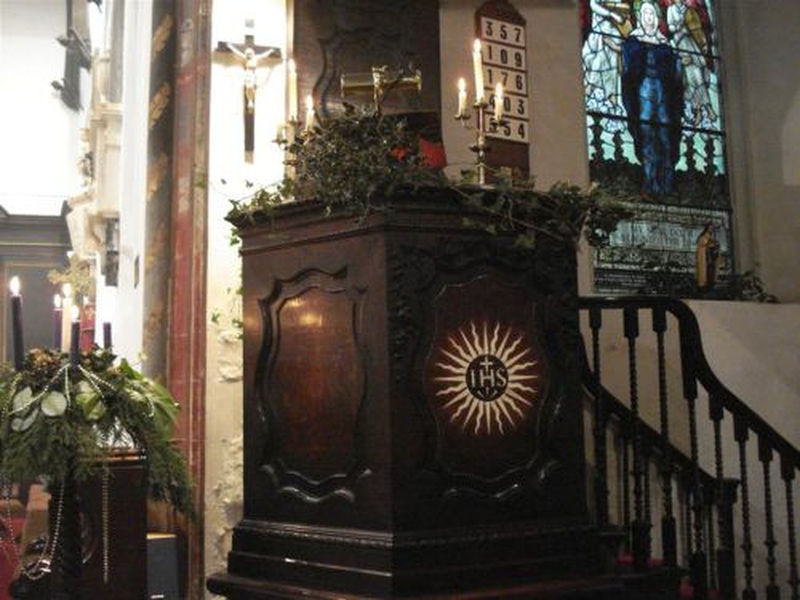 The altar table is the old high altar of St Simon & Jude (the church was closed and the parish united with St George's in 1894), and the canopy came from All Saints' (closed 1971). The statue on the pillar is a copy of a Flemish one of sixteenth-century date. The statue of Our Lady of Walsingham is modern. The two large windows are filled with mosaic glass, of c1867  reputed to be the earliest Victorian stained glass in Norwich. The two small windows (in the old gallery doorway) have two panels of Flemish glass, with scenes from the Book of Tobit  the western one shows Tobit being blinded by sparrows, while the other shows the restoration of his sight. On the wall below are the sword and mace rests, which were used by the Mayor and Corporation when they attended the church in state. The names of Mayors provided by the parish are on the name plates. They are not in their correct place here, and should be affixed to the ends of a pew. 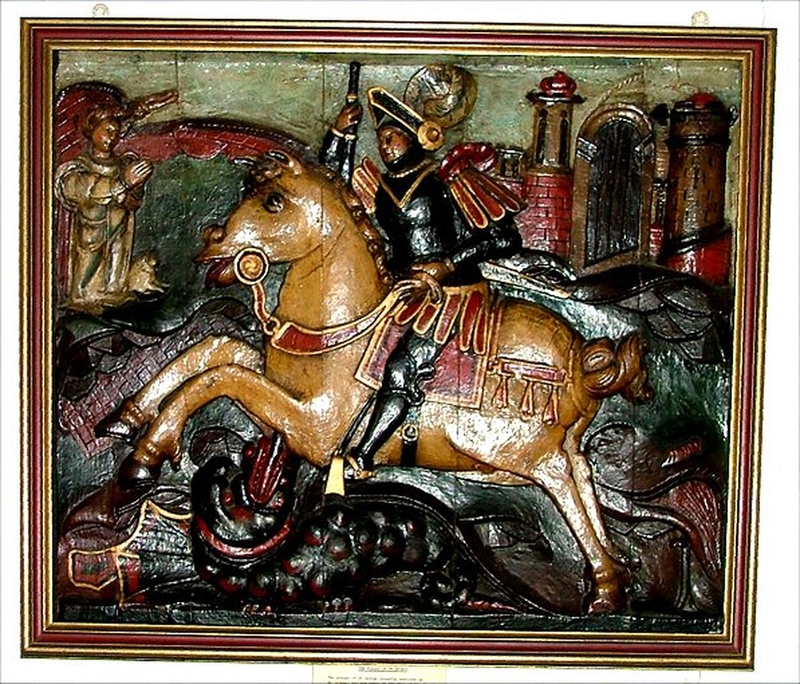 The wooden plaque of St George is early Renascence (c1530-50), and is probably Flemish or north German. 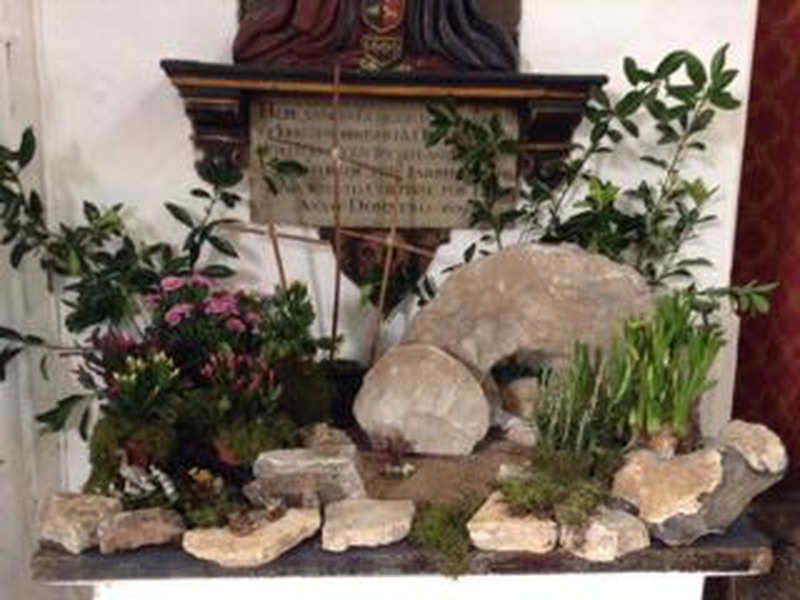 The altar and its furnishings were given in 1955 as a memorial. The western window has two medií¦val roundels. One is a jigsaw of odd pieces; the other is April from a 'Labours of the Months' series: it shews a man hurrying into his house to escape a shower! 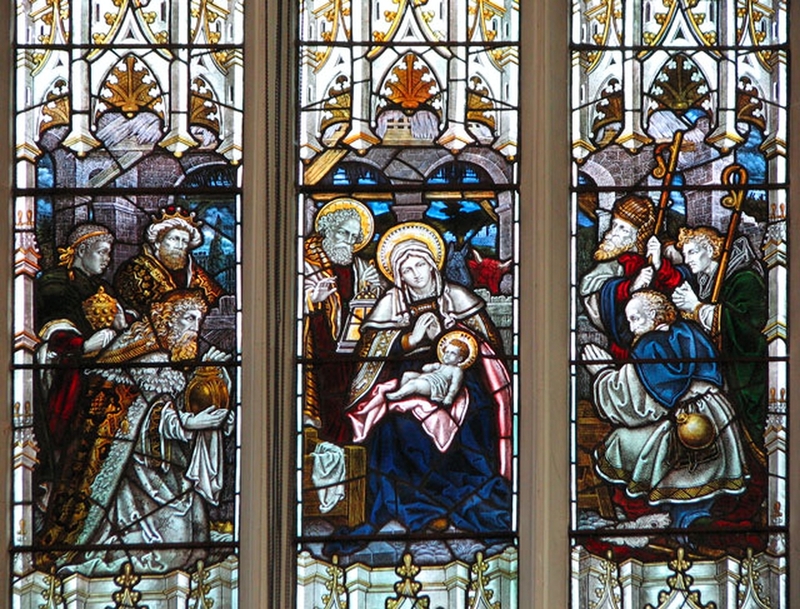 The east window of the aisle contains glass from the studio of William Morris, and the angels show the influence of Burne-Jones. The sixth bell is the clock bell, and is inscribed The gift of Charles Maltby to the parish of St George Tombland 1786. It is hung for use as a sanctus bell. The sanctus bell itself, which was dated 1590, was sold, and is now at Wood Dalling church. Leave the church by the south porch, and turn left. In the aisle wall next to the porch you will see the remains of a blocked up arch. It is not known what this was, but it appears to have been an arch leading into a structure; it may just possibly have been the original south door. On the east wall of the aisle, the stonework makes plain the vanished door which was replaced by the current window: this door led into the south aisle gallery. Notice also the very angular tops of the chancel windows. The front of the south porch is not original: it dates from Christian's work in the 1880s. Originally it had an image niche between two windows over the doorway, and two large niches either side of the door. The east and west walls of the porch are original. Note that the windows have been blocked up. Leave the churchyard, turn right, and follow the pathway round. Under the west window is a smaller window. This was originally an image niche, but was made into a window in the Middle Ages in order to provide some light for the ground floor of the tower. The building in the angle of the tower and north porch is the stoke-hole, erected in the early nineteenth century. The north porch retains its original form. Note the remains of the holy water stoup beside the doorway. The north wall reveals many changes over the years. Between the middle and eastern windows is the scar left when the rood stair turret was demolished. The square area of infill shows where a window was which lit the vestry. From this side the brick clerestory can be seen. On both this and the south side, the brick is nineteenth-century replacement of original seventeenth-century work. On top of the tower is a spirelet in the form of the 'ragged staff'. Made of wood, it is topped off with a metal spike some four feet long. The alleyway through the north churchyard, Tombland Alley, is the remains of the great east-west route through the city, and the building at the east end, the house of Augustine Steward, respects it by arching its first floor over it, allowing passage underneath. The shops which front Tombland are in fact built on the east churchyard.